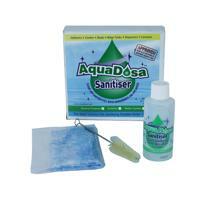 This convenient water cooler care kit disinfects and sanitises your water cooler to destroy germs and bacteria. The pack contains a scouring pad, tap brush and sanitising solution to allow you to take care of your water cooler and provide pure, clean refreshment at all times. Coming in a handy little pack, this versatile set can be easily stored away and is compatible with all types of water cooler.